As the prime minister of India announced, Starting midnight on November 8, Rs 500 and Rs 1000/500rs and 1000rs notes will no longer be legal tender. As this announcement come into force so many people has a doubt that How can I exchange my 500rs and 1000rs notes/Rs 500 and Rs 1000 notes. So we want to share this information regard.. The prime minister said that ATMs across the country will be closed on November 9, and they will not function in parts of the country on November 10.Banks will remain closed on November 9.The Rs 500 and Rs 1,000 notes can be submitted to post offices and banks from November 10 till December 30 with an valid ID card such as a passport, PAN card or Aadhaar card. Those who are unable to exchange their notes by December 30 will be allowed to declare them with the Reserve Bank of India till March 31. There will be a cap of Rs 20,000 on the amount of money that can be exchanged in a week and Rs 10,000 in a day. 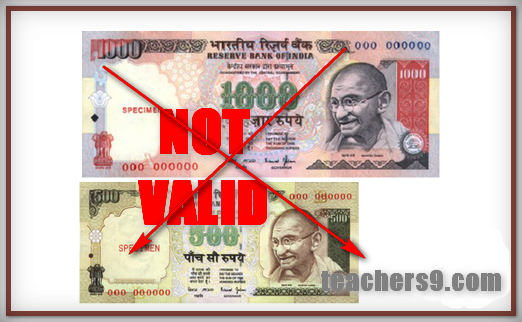 Tourists can change these notes at airports. The Rs 500 and Rs 1,000 notes will be accepted for an additional 72 hours, that is till midnight on November 11. This includes hospitals, railway ticket booking counters, government bus stands, and airports.